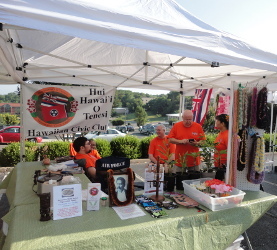 General Membership Meetings: The Hawaiian Civic Club conducts monthly general membership meetings which usually begin at 10:00AM and completed by 11:00AM. The meeting dates are published in each month's newsletter and are contained in the "Dates to Remember" memo referenced above. Changes will be announced through email and on the website. Special meetings are called as needed for unscheduled events and will announced via email. Time permitting, they will also be posted on the website. Youth Group: In addition to our general membership meetings, our youth group participates in additional activities at various times throughout the year. These activities will typically be scheduled by the youth group coordinator. They will be involved in numerous supervised activities which will teach them crafts, Hawaiian language, ukulele skills, etc. Members, please encourage your children to become actively involved in this program. Classes: Weekly Hula classes are conducted at the Crow Community Center. Our adult class meets each Tuesday at 5:00PM followed by the keiki (children's) class at 6:00PM. Additional sessions are scheduled as needed to prepare for specific events. Any member of the Crow Center may participate in these classes; however, to participate in Hawaiian Civic Club performances requires membership in the Club as well. Fundraising activities are scheduled throughout the year at times that are best for each particular activity. The events are announced in newsletters as well as in the "Dates to Remember" memo. Please click HERE to download a copy of our "Dates to Remember" for 2018. We encourage all our members to become actively involved in all club activities. We also plan other health and cultural events throughout the year. Please check this website frequently for updates. Note: We would be delighted to be included in any activities, functions, or events that may be planned. We have a number of different cultural contributions to offer. We can coordinate Luau's, display Island arts and crafts, and perform our ever-popular authentic Hula. We are not limited to one particular audience as we are willing to share our culture with everyone. Please email us at HHOTHCC@gmail.com for more information.